Find out what our experts have to say about Honda Activa 5G! 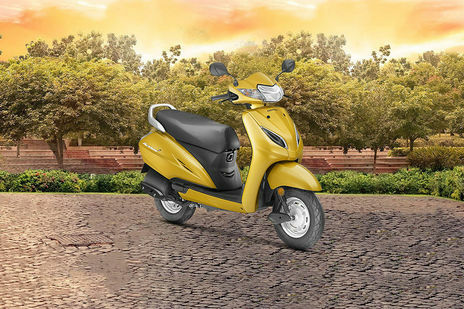 The all-new Activa 5G was recently launched by Honda featuring an all-LED headlamp and a positional lamp, in two new colour schemes - Dazzle Yellow Metallic, and Pearl Spartan Red in addition to the existing colour schemes. Amongst most notable changes are the new chrome garnish at the front, an extra durable protector for the muffler and an all-new instrument cluster with service due indicator and ECO options. The 2018 Activa 5G continues to draw power from its 109.19cc, single-cylinder, 4-stroke, air-cooled, BSIV-compliant engine, equipped with Honda Eco Technology (HET), churning a max power of 8.11PS at 7500 rpm and a peak torque of 9Nm at 5500 rpm. According to Honda, the scooter can clock a top speed of 83kmph, returns a mileage of 60kmpl and can store maximum 5.3 litres of fuel. The Activa 5G is available in two variants - STD and DLX. The STD variant is priced at Rs 53,565 while the DLX variant is available at Rs 55,435 (both ex-showroom, Delhi). There’s a huge list of available colours- yellow, brown, grey, black, silver, white, red, blue, and the two new ones. The Activa 5G lock horns with the TVS Jupiter, the Hero Maestro Edge, the TVS Wego, and the Yamaha Alpha. The least priced variant is Honda Activa 5G STD priced at Rs. 62,818 and the most priced variant is Honda Activa 5G DLX priced at Rs. 64,812. Choose the Honda Activa 5G which fits the bill of you. Honda still rules the scooter segment in India with the famous and yet dependable brand Activa. 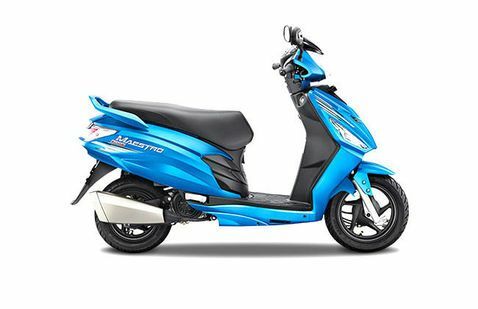 They recently proved their poweress again by launching the 5th generation of India’s best selling scooter, the Activa 5G. The Activa 5G is competing against the Hero Maestro Edge, the TVS Jupiter, the Yamaha Fascino, and the TVS Wego. It comes with a new positional lamp, an all-LED headlamp and two new vibrant colour schemes - Dazzle Yellow Metallic and Pearl Spartan Red. It now has a all new instrument cluster which not only shows when your service is due via an indicator but it has ECO options as well. The 2018 Honda Activa 5G also gets new chrome garnish on the front and extra durable protector for the muffler. The front and rear hooks, a smart seat-opening switch, 18-litre underseat storage, and mobile charging socket under the seat make the Activa 5G very convenient and useful. But despite all this the basic mechanics of the scooter remains unchanged. The new Activa 5G still continues to draw power from the same engine which is now BSIV-compliant. Activa 5G with a total fuel tank capacity of 5.3 litres, gives a mileage of 60kmpl and reach speeds of 83kmph. The Activa 5G comes equipped with Combined Braking System (CBS) which provide for a safer braking and stability. Currently, the new Activa 5G is offered in two variants - STD and DLX. The STD variant is available at Rs 52,460 (ex-showroom, Delhi) while it is Rs.1865 more for the DLX variant. For the first time Activa 5G features a new LED position lamp and all-digital headlamp along with it. Activa 5G is given an elegant touch and a classy look by the new chrome garnish on the front. The 3D logo on the side looks very premium and it does fit well with the overall styling. The Activa 5G also features the silver painted grab rails which are more comfortable now, along with a bright LED tail light and turn signal indicators at the rear. The 18 litres of underseat storage is enough to fit in a helmet or any other items, includes a mobile charging socket as well. The Activa 5G DLX gets a digital-analogue instrument cluster that combines an analogue speedometer with digital readouts like odometer, trip-meter, fuel gauge and a clock It also has special service reminder and ECO indicators too. While Activa 5G STD, gets an analogue instrument console only. The Activa 5G is more convenient as the 4-in-1 lock in the front, now comes with a smart seat opening switch to open the seat without any hassles. Other things included are the front hook, a rear retractable hook and an Automatic Headlamp On (AHO) feature as well. The Activa 5G now weighs at 109kg as it comes with an all-metal body. The USP of Activa has always been its class leading refined engine which still continues to be used in 5G model as well. The new Activa 5G is still powered by same old 109.19cc, single-cylinder, 4-stroke, and air-cooled engine. This BSIV-compliant engine now generates a max power of 8.11PS @ 7500rpm and peak torque of 9Nm @ 5500rpm. For city commuters the smooth engine is a boon, but also has enough power for the highway riders as well. Activa 5G provides better fuel efficiency as its engine runs on the Honda’s Eco Technology (HET), mated to a CVT gearbox. As per Honda, Activa 5G with a total fuel tank capacity of 5.3 litres, gives a mileage of 60kmpl and reach speeds of 83kmph. The spring-loaded hydraulic units at both front and back on the Activa 5G, provide decent suspension comfort. The 10-inch alloy wheels fitted with tubeless tyres reduce the chances of immediate deflation and help you reach wherever you want to go with no unwanted surprises on the way. Unlike some of its competitors the latest Activa 5G doesn't even offer disc brake as an option. But the 130mm drum brakes at front and back, coupled with Combined Braking System (CBS) provide for a effective braking and stability. To increase its visibility the Activa 5G comes with the mandatory Automatic Headlamp On (AHO) feature. The Activa 5G misses out on the disc brake feature, but Honda's special Combined Braking System (CBS) does provide better effective braking and stability. The CBS distributes the brake load by activating both the breaks simultaneously even when only the rear brake lever is pressed. Hence its handy when sudden brakes are applied and also prevents the scooter from slipping or skidding. In terms of features, the Activa 5G comes with a mobile charging port, a 4-in-1 ignition with the seat-opening switch, a front hook and a rear retractable hook. The top end variant also gets a digital-analogue instrument cluster that combines an analogue speedometer with digital readouts like odometer, trip-meter, fuel gauge and a clock It also has special service reminder and ECO indicators too.